BellaDati Platform allows you to integrate, embed and enhance the functionality of your apps with analytics. Now let’s have a look at the competitive advantages brought to you by the BellaDati Platform. According to Gartner, 85% of analytics and big data projects fail. This is mainly due to the low user adoption and difficulty embedding an analytics platform into an existing product. It is important to deliver the right analytics which will simplify the decision making for end users, will not require too much work from the user and will easily provide the insights the users are looking for. Embedding analytics platform into the existing product will increase the adoption rate of analytics. BellaDati Platform provides a wide range of APIs which will allow you to smoothly integrate analytics into your application and flexibly enable new features and analytic insights to your users. The analytics insights is an obvious added value of the embedded analytics. But that’s not all. 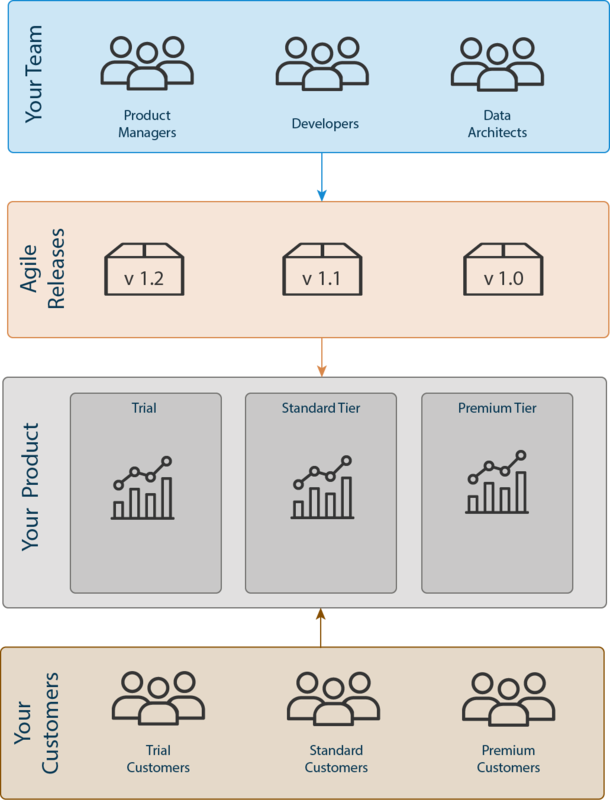 With the BellaDati Platform, you can create product tiers to deliver custom levels of analytics to different customer segments, tailor experience to each segment and empower advanced (premium) users by letting them create own reports and dashboards or even customize the layout for every product tier or customer. It is critical to release analytical features across all the customers – who are using cloud or on-premise version of your application. With the BellaDati Platform, you can frequently release new analytics features and distribute the new analytics insights across all customer instances with the option to automate this process. At the first look, extending your product with analytic services may seem as a simple task – you will just add some charts. But after you realize that the users need various type of charts, tables, maps, ETL and a high level of flexibility, you may realize that this task is not so easy anymore. With BellaDati Platform, all the required features (data warehouse, ETL, performance, connectors to various data sources, user management, user permissions, data security, various types of charts etc.) are available out-of-the-box. Wide range of BellaDati APIs will allow you to integrate, embed, and extend the functionality of your existing or planned products, which will save initial costs for the development, decrease opportunity costs by keeping your development resources focused on your core product and accelerate the development of analytics insights with fast go to the market – first revenue. We at BellaDati know exactly what it means to implement an advanced analytics solution which is powerful and flexible on the one hand, but also easy to use on the other hand. With integration of BellaDati Platform, you can focus on your core product while delivering contemporary state-of-art analytics developed by BellaDati – company whose entire business is focused on Analytics and IoT.